White paper on crime 2004 Part1/Chapter2/Section4/2. 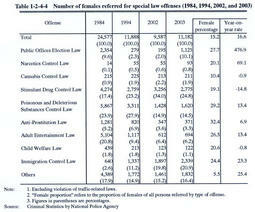 Table 1-2-4-4 shows the number of females referred for special law offenses excluding violation of traffic-related laws in2003,by type of offense,compared with in1984,1994,and2002.In2003,females referred increased by16.6%from2002.Stimulant Drug Control Law violations had the largest share,followed by Immigration Control Law violations and Poisonous and Deleterious Substances Control Law violations. The female proportion in all persons referred in 2003 was relatively high for violations of Anti-Prostitution Law,Poisonous and Deleterious Substances Control Law,Public Offices Election Law,and Adult Entertainment Law.